I know I have been a little absent this past week. All is AOK, I have just been adjusting to being back at work after a 6 week break and like so many of you, getting the kids back into the swing of school and all the kerfuffle that goes with it. I have been spending most of my spare time on getting myself organised and planning out new routines so that I have time to spend with the family and do some of my other interests, without work or blogging cutting into that time. I just wanted to say thank you all for the lovely comments you have left on my posts over the past week and I am so sorry I have not had a chance to respond as yet. But believe me, they mean the world to me and I so appreciate you taking the time. This past weekend was spent getting organised for Sam's 7th Birthday party. His birthday was actually a few weeks ago now, but as anyone who has a kid with a birthday in January knows, it is not a date conducive to parties as everyone is away on holidays. So we waited for school to go back and celebrated the end of the first week back by having Sam's party at a Bowling Centre. They had a blast! Now we all know though that the key to a successful party is in the details, actually really only 2 details - The Cake and the Lolly Bags. They seem to be the gauge of a party these days. "How was the party guys"? "Oh great, you should have seen the cake!" or "Oh great, check out this lolly bag". However that being said, my son did attend a party on Friday night which saw all the kids come home covered from head to toe in mud, and that particular party has been deemed THE PARTY OF THE CENTURY!!!! Anyway Sam took FOREVER this year choosing the theme of his cake. He was finally all set to go with a gorgeous Galaxy cake he had seen in a book by Louise Fulton Keats, but at the eleventh hour he had a change of heart. 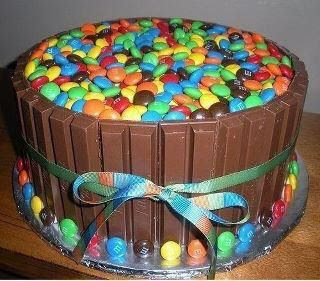 Whilst I was perusing Pinterest one night, he spotted this beast whilst looking over my shoulder and suddenly knew EXACTLY what cake he wanted. So I started by baking a Large but basic super moist vanilla cake. And then covered it in vanilla frosting. TIP: you do not have to be neat with this part as you are going to cover it up anyway. Then the construction began and I set about chopping up 16 Kit Kats and assembling the beast. We then topped it all off with a large bag of M&Ms and tied a ribbon around it all to make sure it held together tight. Let me tell you - He was one very HAPPY boy. Whilst the Friday night Mud Party was the Best Party EVER, this cake ranked up there in its own category according to those who devoured it. The Loot bags were just red paper bags filled with treats and I made some labels (bowling themed) on the computer with a little thank you message from the birthday boy to stick on the front. So with the cake and the lolly bags sorted, the only thing left to do was have some fun, which they certainly did. Ohhh I still cannot believe this little guy is 7. Where does time go! Do yourself a favour and check them out.